← What’s 15% on a Miracle? Donna and I first met through our mutual love of belly dance at a cafe in Maryland. Eventually we found we had a love of writing, which led to us getting involved in NaNoWriMo in 2012. Her first book, The Fade’s Doll, is still pleading to be finished, so she has successfully managed to avoid the tedium of editing thus far. Which will be done with great precision as Donna is CAP-OM certified and a member of The Greater Baltimore IAAP chapter of which she was recently voted as “Member of the Year.” You will not misplace a comma in her presence! She’s a huge fan of hot tea and pumpkin cookies. And of course, she has her own infertility story which you can read in full here. HFM: In your introductory post for POP, you say “your story has already been written.” When you were still in the trenches of trying to conceive, what resources for coping and personal expression were available to you, if any? DM: I wasn’t aware of a lot of resources then. It was the mid-80s and early-90s, and there just wasn’t a lot going on. RESOLVE was already around, as were Compassionate Friends. I went to one RESOLVE meeting while in the midst of a miscarriage. The leader introduced me and said, “She’s having a miscarriage right now,” at which point I felt like a freak of nature and never went back. I don’t fault her – she was doing her best to share sympathy – but I didn’t feel any better when I left than when I’d gone into the meeting, so I didn’t go back. Compassionate Friends was more for those who had lost a ‘real’ baby through stillbirth or SIDS or something, so I didn’t fit there, either. When I see the resources and open sharing today, I am really glad that the situation has changed so dramatically. HFM: I know one of your hobbies is belly dance. What drew you to the art form? DM: Truthfully, it wasn’t a love for dance at the beginning. I’d sprained a rib (yes, that’s possible!) and needed some kind of exercise to strengthen my torso. I wasn’t interested in Pilates at all, so I sought out belly dance as a way of exercising that would be more fun. I didn’t know I was going to get so much out of it, from a better body image to great friends! HFM: When you wrote The Fade’s Doll, you took it in a creepy, supernatural direction. I know you can’t reveal spoilers, but where did you draw your inspiration for that? DM: Well, it’s not really finished yet. I have my notes and synopses done for the remaining chapters, but I’ve been so busy with other endeavors that the business of writing still awaits me. As for the story line, it wrote itself. I sat down one night to outline the premise. By the time I was done two hours later, the antagonist was in the midst of hijacking my story. I didn’t appreciate the direction he was taking it, but after two days of arguing we worked out a compromise: he gave me back some control, and I let him live. Soon after that, the doll staged a hijacking of her own so she could tell the story in her own words. When it’s her turn to write, she is almost frighteningly glib. HFM: If someone were to make a movie of your life, which actress would you choose to play you and why? DM: Hmm…that’s a tough one. I don’t follow movie stars and can only rarely put their names and faces together. I don’t understand the hype around celebrities; it’s an artificial construct. And with that statement I’ve probably eliminated any possibilities of anyone ever wanting to play me, so I’m off the hook for this answer, right? HFM: What’s your favorite song? DM: It’s really hard for me to pick one favorite because I like so much music. It really depends on the genre and even then I have a hard time narrowing it down. If we’re talking classical music, then definitely Mendelssohn’s Scottish Symphony. I was raised on country and still have a weakness for Marty Robbins’ El Paso and Freddie Fender’s Before the Next Teardrop Falls (and a spiteful streak in me loves Clay Walker’s Then What because art imitates life, right?). I’ll also take Hal Ketchum’s I Know Where Love Lives any day. For alternative , I still favor Bob Sima’s whole Pour It On album for its message, and Freedom Finds You from his previous band’s Stereopool incarnation. And even though I’m not a churchgoer, I often listen to Christian contemporary during my commute. I’ll stop there, because I’m sure this is far more complex an answer than you wanted. 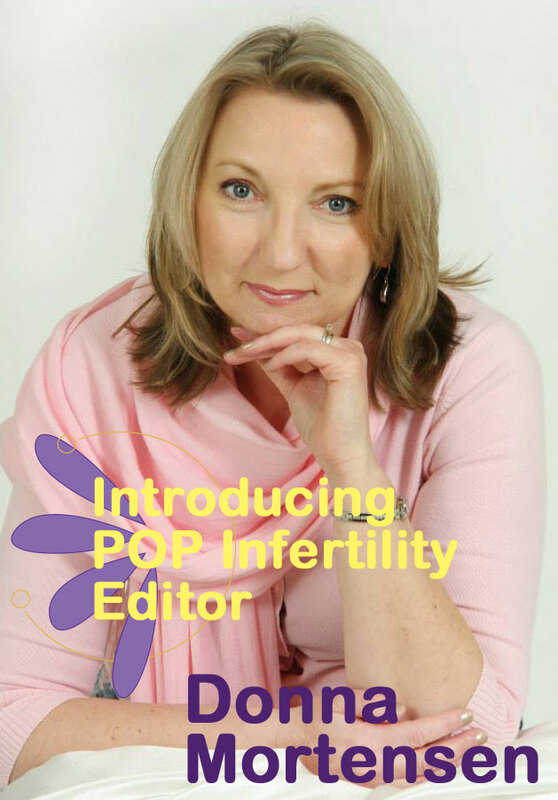 Thanks so much to Donna for answering my questions and being a part of Prose Over Pain Infertility Journal. Again, you can read her full in-depth introductory article on the POP Infertility website by clicking here. And if you want to read Donna’s recently published prose, her work of flash fiction is featured in Haunted Waters Press Summer 2013 edition! Great article. I feel like I know Donna a bit more now. Positively love that Hal Ketchum song BTW.